It's not always easy getting Veggie ingredients you need for cooking up recipes. 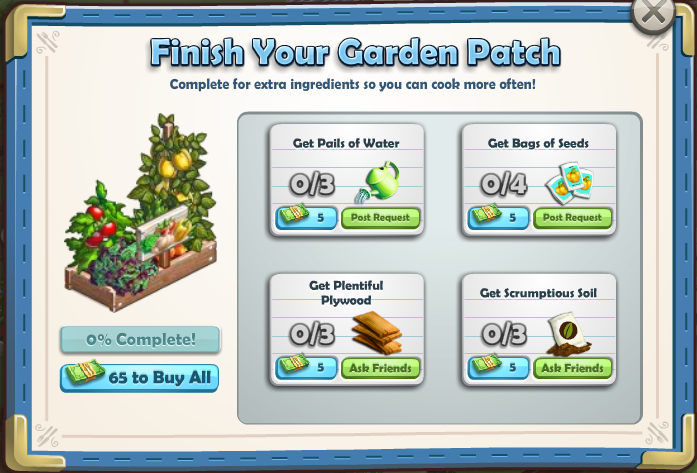 Luckily ChefVille has just introduced a quest that will get you a free Garden Patch. 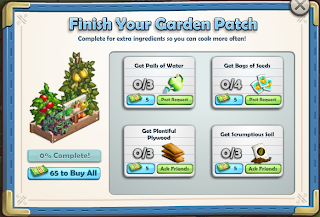 Once you unwrap and build this garden patch you will be able to harvest a variety of Veggies. You will no longer need to rely solely on your 2 Tomato plants, Onions and Mushrooms. #1. Click on the Quest "Friend To Flora"
#2. Buy 2x Daisy Plants from the Marketplace and collect Mixed Greens from each one. #3. Go to your inventory and place down the garden patch. It will look like 2 unwrapped packages once placed down. You can just click on the green "Show Me" button if you cannot find it. #4. Place down the packages and unwrap them 3 times (Total Cost of 3x Energy). #5. Click on the packages to build them. You will have to obtain 3x Pails of Water, 4x Bags of Seeds, 3x Plentiful Plywood and 3x Scrumptious Soil to build the Garden Patch. 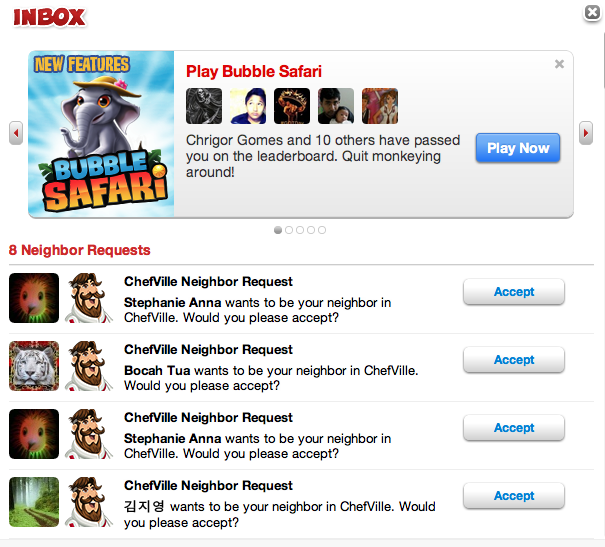 The 3x Pails of Water and 4x Bags of Seeds can be obtained by posting a request on your Facebook wall. Friends can click on that link to give you either of these items. The 3x Plentiful Plywood and 3x Scrumptious Soil can be obtained by asking friends. Friends will see all requests in their Inbox window (As shown on the left). Note: As a last resort you can buy the items for Chef Cash, although this costs real money to get. Hope this helped! Please comment below if you feel there is anything else important to note about the Garden Patch in ChefVille. Thanks For Reading! New Hot Dog Cart Event!